James Comey's media tour, ahead of his new book, starts Sunday night with an interview on ABC. He'll also appear on the The Late Show With Stephen Colbert and NPR's Morning Edition. 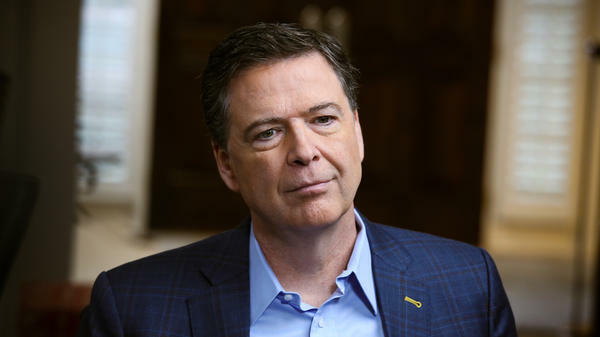 Just a few hours before James Comey's first television appearance ahead of his new book's release, President Trump published a string of tweets calling Comey a "slimeball" and saying the notes the former FBI director says he took were "fake." In an interview between Comey and George Stephanopoulos that aired Sunday night on ABC — launching a TV and radio tour for Comey that will include an appearance Tuesday on NPR's Morning Edition — and a CNN town hall next week hosted by Anderson Cooper, the former FBI director said he believed there was "some evidence of obstruction of justice" by the president, based upon a now-infamous meeting he had with Trump in which the Michael Flynn investigation was brought up. "It would depend and-- and I'm just a witness in this case, not the investigator or prosecutor, it would depend upon other things that reflected on his intent," Comey tells Stephanopoulos. Comey's book, A Higher Loyalty, will be released on Tuesday and in it, he calls the president "unethical, and untethered to truth and institutional values." In a separate interview with USA Today, Comey — in a reference to salacious allegations contained in an unverified dossier created by former British intelligence agent Christopher Steele — said it is difficult "to explain some things without at least leaving your mind open" to the possibility that such compromising information exists. "There's a non-zero possibility that the Russians have some, some sway over him that is rooted in his personal experience, and I don't know whether that's the business about the activity in a Moscow hotel room or finances or something else," he said, referring to unsubstantiated allegations that Trump had a tryst with Russian prostitutes in Moscow in 2013. However, Comey told ABC that the FBI opened its investigation into possible Russian influence in the 2016 campaign not as a result of the Steele dossier, which President Trump and some Republicans contend, but when it received information that George Papadopoulos, then a foreign policy adviser to the Trump campaign, had "been talking to someone in London about getting dirt on that the Russians had on Hillary Clinton." The White House and Republican Party have launched an effort to discredit Comey as outlets, including NPR, began reporting on the book's contents last week. On Friday, White House Press Secretary Sarah Sanders called Comey a "disgraced partisan hack" and the President called him "a proven leaker and liar." "Slippery James Comey, a man who always ends up badly and out of whack (he is not smart! ), will go down as the WORST FBI Director in history, by far!" Trump wrote. Trump also reacted to a teaser clip ABC released about Sunday night's Comey interview. In it, Comey says his decision to announce that the FBI was going to re-open its investigation into Hillary Clinton's use of a private email server just days before the 2016 presidential election was influenced by Comey's belief Clinton would defeat Trump. "I was operating in a world where Hillary Clinton was going to beat Donald Trump, and so I'm sure that it was a factor," Comey says. "I don't remember spelling it out, but it had to have been, that she's going to be elected president and if I hide this from the American people, she'll be illegitimate the moment she's elected, the moment this comes out." Trump said Comey handled the probe "stupidly." "In other words, he was making decisions based on the fact that he thought she was going to win, and he wanted a job," Trump wrote. "Slimeball!" FBI directors serve ten year terms (although they can be dismissed by the president). Having been sworn in in 2013, Comey's time leading the FBI was not due to end until 2023, well beyond the conclusion of what would have been Clinton's first term in office. Trump also repeated his belief that the notes Comey says he took about his interactions with the president are "FAKE!" and that Comey is lying when he says the president asked him for loyalty. Trump fired Comey last May when Comey was in charge of the Justice Department's investigation into Russian interference in the 2016 election, and potential connections to the Trump campaign. That decision has many, reportedly including special counsel Robert Mueller, questioning whether Trump obstructed justice. A new ABC News/Washington Post poll out this week says that Americans find Comey to be "more believable" than Trump, 48-32 percent, highlighting the White House's need to discredit him. The Republican National Committee is reportedly preparing a widespread campaign to help, including the launch last week of a website called "LyinComey.com."